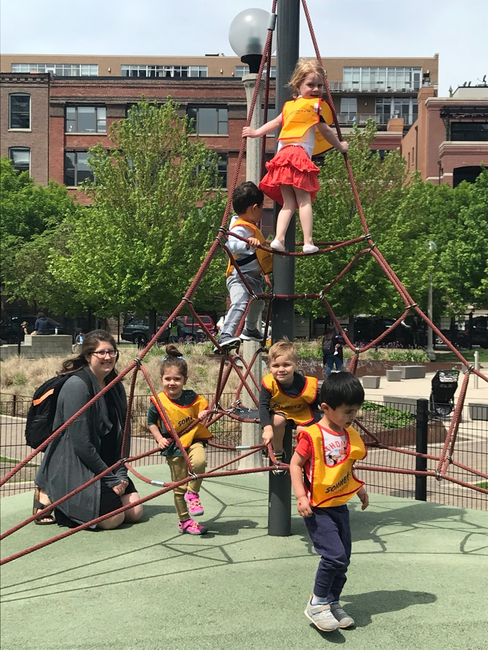 Our West Loop students enjoy outdoor time at the wonderful, Mary Bartelme Park, located directly across the street from our school. For Chicagoans, Spring may be the most anticipated season of the year (especially if you have a toddler or preschooler). After a long winter, the warmer temperatures allow us to shed those layers of heavy coats, and finally escape outdoors under the bright sun! We are fortunate that each Sonnets Academy School is located right next to some of the best parks in Chicago. Now that our lovely Spring weather is here, we are ready to extend our classroom to the outdoors. This month teachers introduced the curriculum theme, Discovery Explosions. They have presented some amazing lesson plans focused on, space, earth science, art experimentation, weather and plants! Be sure to check out our Home/School Connection and share in the learning with your little one! Before we dive into our month of Discovery Explosions, Sonnets Academy would like to congratulate our very special prekindergarten class on their graduation this month! This is a bittersweet end to the school year for us; many of our prekindergarten students have been with us since 6 weeks of age. We are so proud of all our students and very happy we have the summer with them before they are off to kindergarten. Everyday our younger and older infants experience socialization with their friends and their teachers. By singing songs and reading books they interact with their peers and adults through language skills and different facial expressions. The children begin to mimic sounds and recognize that facial expressions match the spoken word - this is wonderful for language development. Another great way for our children to learn is through sensory. This month we have been spending a lot of time with textures; we have touched different items such as dirt, seeds, grass, water, and flowers. Teachers have incorporated literature into these activities by reading books about how flowers grow from the ground and use the dirt as their nutrients. One of our older infant classrooms used every day items from home to lead a sensory activity. Teachers placed shaving cream in a bowl and added food coloring. They encouraged the infants to touch, handle and move the shaving cream through their tiny little fingers. Infants watched the colors mix and move. 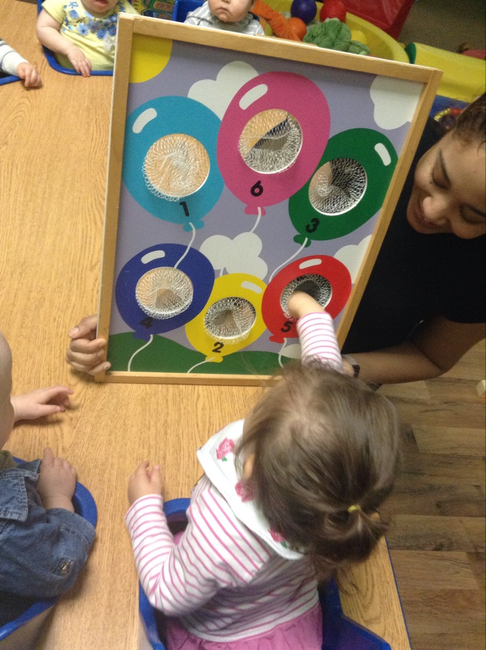 This activity provides stimulation to the tactile system, which is good for developing the sensory system. The activity can help promote creativity and imaginative play…and it keeps those little ones busy for a while! Infant Home/School Connection: Headed outdoors? Visit the park; let your little one observe all the trees, plants, and different leaves. Try placing your infant in the grass, it’s great for exploring and sensory - they may jump right into the grass or jump right out. If they jump right out - that is okay, be sure to slowly introduce them to new textures. Introducing them to this new outdoor world will lay the groundwork for an explorative summer! Our busy toddlers blasted off into space. Space exploration is so much fun when you are a kid. Our Toddlers have been exploring the moon, stars, comets and even little green aliens this month. Through exploratory art lessons they have been happily getting their hands on all the paint, glue and glitter they can. Teachers helped the children create the moon from a foil stamper, little aliens from green paper and planets and stars from lots of glitter! 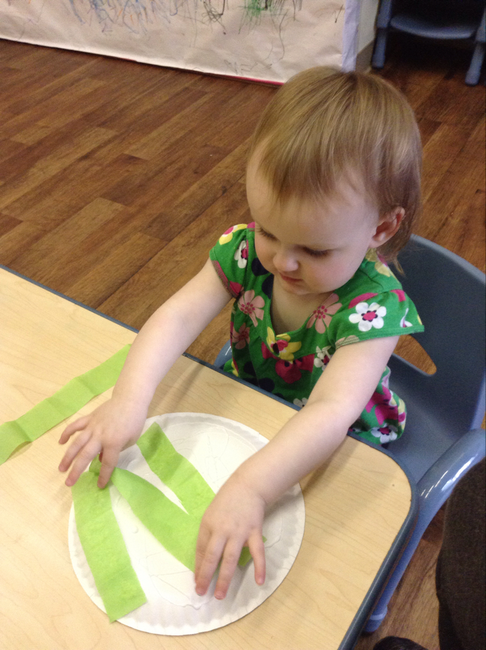 By encouraging them to pick up different shapes and glue them to paper it helps develop dexterity and strength. All these lessons are fantastic for a toddler’s fine motor skills. Fine motor skills are those that involve a refined use of the small muscles that control the hand, fingers and thumb. With the development of these skills, a child is able to complete important tasks such as writing, feeding oneself, buttoning and zippering. 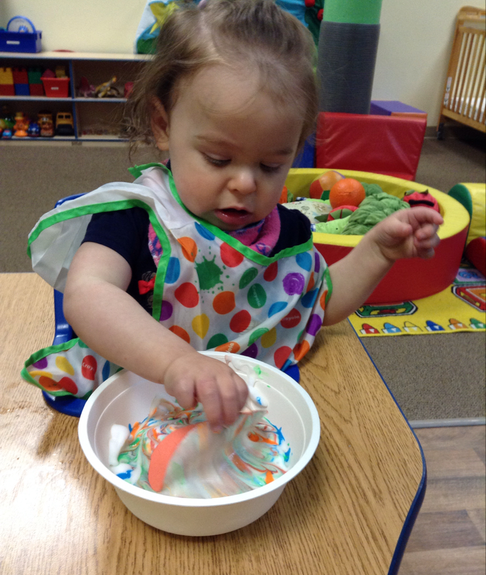 These abilities gradually develop through experience and exposure to a variety of toys, materials and even foods. Toddler Home/School Connection: A great way to explore space with your Toddler is to help them discover the difference between “day” and “night”. Begin with a piece of paper and draw a line down the middle - on the left side draw all the images of day and on the right all the images of night. Let your toddler color in these images using any color they like, they’ll love to contribute and add to what you are doing. Don’t forget the music! Everything is always more fun with music, here are some great songs to sing with your toddler about space and stars. Our twos teachers have been discussing the life cycle of a butterfly with the children. It’s wonderful to watch the children’s faces as you tell them about this process. Teachers begin by explaining that a tiny worm like creature will morph into a beautiful butterfly. Each twos teacher has added live larva exhibits to their classroom so that the students can watch this magical life cycle. The process takes a couple of weeks, and our little ones may become impatient to see our beautiful butterflies. This is okay; patience is a great learning lesson. While we patiently wait for their arrival, teachers will talk through the process with their students and incorporate lots of wonderful lesson plans to help them understand what is happening over this long span of time. Dramatic play is a favorite of our busy twos! The children have been acting out the story of, ‘The Hungry Caterpillar’. Teachers have made different props for the children to use as they move their way through the story. The children will also work together to act out the four life stages of a butterfly. Curl up like an egg. Be as still as a chrysalis. Twos Home/School Connection: Click here for a wonderful worksheet you can share with your little one. Place the life cycle elements in order. Let your child color in the pictures and act out the process. If you have older children, they will love to help along. This is a great way to add creative movement into the lesson. The magic of Science! This past month, we have some wonderful science/math lessons with some extraordinary discoveries. During one lesson, each child was handed a piece of white construction paper with baking soda sprinkled on top. The class used pipettes to squeeze colored vinegar on top of their paper! Then they watched for a reaction - the vinegar and baking soda mixed together to create bubbles and a fizzing sound! The children thought this was so cool! The final product also created a beautiful art piece - the colored vinegar produced pretty colors on the paper! When the papers dried, we hung them up on the classroom. Another day, each child took a turn participating in a Sink or Float science experiment! One child at a time took a turn choosing an item, guessing if it would sink or float, and then placing it in a bucket of water! The class was very surprised when some items actually sank instead of floated or floated instead of sank! Take a look at the whiteboard picture to see which items sank or floated! Preschool Home/School Connection: Now that the warmer weather is here - the sink and float activity is a great one to play at home. Start the activity by walking your home and collecting toys and objects that you could test out. Make sure to pick things you know would sink and float. Using a water table or bucket with water add your toys/house times to the water. Begin by saying the object out loud, and ask your little one to guess - “sink” or “float”? If you have an ice scooper, bring that as well. Encourage children to practice scooping up objects and then dumping them out - this is a great way to practice some of those fine motor skills. Our prekindergarten students are learning about the sun, moon and the stars! Teachers have introduced the idea of our solar system to the children. Through literacy and exploratory art activities, teachers helped the children learn about the solar system. The children have been practicing “planet” sight words, as well as the names of the planets, teaching the students the “MVEMJSUN” phrase - Mercury, Venus, Earth, Mars, Jupiter, Saturn, Uranus, and Neptune. 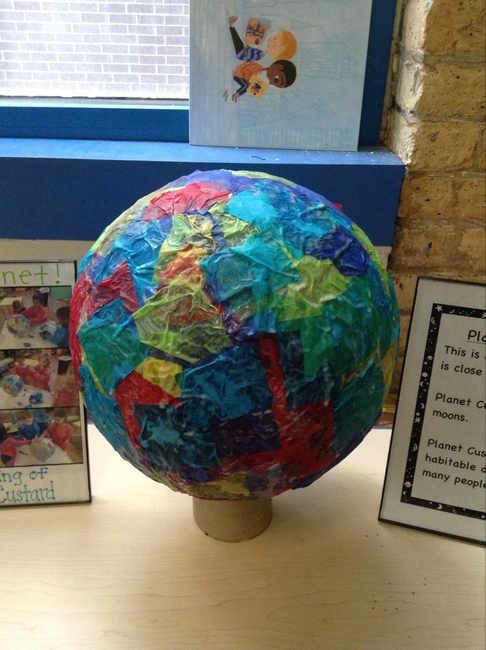 Teachers led the children through an exploratory art project where they built their own planet! The children constructed a large-scale sculpture of a new planet - they gave their planet a name and created a story about it. We were so proud of all their hard work, we invited their parents and caregivers to meet this newfound land! Pre-Kindergarten Home/School Connection: The solar system is an advanced topic, however when you break it down into a collection of planets - the children are so excited to learn about this community of brightly colored and unique lands. Watch the below video about the solar system and then help your child label the planets on the attached worksheet. Follow me! Señor Hamlet will sing about different body parts as he points to that body party. With the assitance of thier teachers, the infants will follow his lead. Teachers will help the infants reach their head, shoulders, arms, feet and toes. Follow the pattern! The children will form a circle, every student will have a different instrument in hand. Señor Hamlet will randomly point to one student at a time. The student will then play his/her instrument. Together the class will create different sound patterns that we’ll repeat. Make this sound intro! Señor Hamlet will start to sway back and forth and mimic a sound - he wil encourage students to follow and repeat his sound and action. From clapping, to making high pitch sounds to low tones at different rhythms. Through music and movement the students are learning music appreciation, instrument recognition and memory. Infants have been busy building rainbow towers, putting together rainbow caterpillars and watching as a lady bug kite flies overhead. These visual lessons help infants not only to strengthen muscles, but foster learning. Their visual senses send information to their brain in order to understand the world around. This is a learned behavior that is only achieved through interaction - a crucial step in their development. Duck, duck, goose anyone? Students will be taught to say: Pato, Pato, Ganzo as everyone will have a chance to go around choosing a friend to be the Goose! How many colors are there? Rojo, Anaranjado, Amarillo, Verde, Celeste, Azul, Morado. Señor Hamlet has been using felt poms and color paper to teach the students sorting and color recognition. While sorting and reading the colors out loud the children learn together.